How strong is anti-incumbent fever? 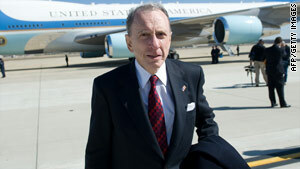 Sen. Arlen Specter, a longtime Republican-turned-Democrat, faces a tough primary fight this year. Washington (CNN) -- Common wisdom suggests that Americans' anger toward government, seen through protests and polling, will lead to high voter turnout in the primaries and a bucking of both party's incumbents and establishment favorites. "While Republicans in certain primaries have these problems, when November comes it's not going to be about incumbency, it's going to be about who's running the country," said Stuart Rothenberg, publisher and editor of "The Rothenberg Political Report." Rothenberg, who closely follows House and Senate races, noted that the focus in midterms will be "anti-Democratic." But the recent race for the GOP primary in Utah indicates that getting to the top will not be so easy for incumbent Republicans, either. Sen. Bob Bennett came in third in balloting at the state party convention behind more conservative candidates Tim Bridgewater and Mike Lee. The top two vote-getters will face off in the state's Republican primary. One of the top issues conservatives cited in the case against the third-term incumbent was his support for the Obama administration's financial bailout known as TARP. The issue is a hot button for fiscal conservative and Tea Party activists angry at what they see as big government afraid to tackle the soaring debt and federal spending. In Arkansas, Blanche Lincoln is seeking her third term as a Democratic senator, but she is in a hot primary race with the more liberal Lt. Gov. Bill Halter before the June 8 vote there. "The liberals don't think she has been a strong enough Democratic ally for the Democratic Party -- that she waffles too much and [has] been willing to work with Republicans too much," said Rothenberg. In West Virginia, 14-term Democrat Rep. Alan Mollohan is competing in the May 11 primary against state Sen. Mike Oliverio. The primary battle, observers note, is the first real challenge for Mollohan since taking over the seat in 1982 when his father retired from it. Mollohan has been criticized by some in the party for his vote against the cap and trade provision in the House's climate change bill, which passed last year. The rush to judgment coming from Bennett's loss -- and in the Democrats' cases -- is not necessarily a blanket statement on incumbents. As for Bennett's fight, Rothenberg pointed out that you can't compare primaries with a lightly attended convention by party activists and "the true believers." "[While] there is some anti-incumbent mood out there and it's affecting both parties, part of the anti-incumbent mood is from a fervor on the part of the most conservative elements in the Republican Party as they look for more purity in their candidates." Others, however, see the anti-incumbency mood as a key factor in November. "I think it is absolutely an incumbent problem," said Amy Walter, editor-in-chief of the political tip sheet The Hotline. "I sat down with a Democratic pollster the other day and said that's really the issue. You cannot even underestimate the disgust that voters have with anything Washington." Her view is backed up by a recent Pew Research Center poll, based on polling conducted in March and April, showing that a growing segment of the American public holds intense anti-government views, with those surveyed describing themselves as angry with the federal government. In addition, Pew's report indicated that "consistent with this pattern of partisanship, anti-government sentiment appears to be a more significant driver of possible turnout among Republicans and independents than among Democrats." But if recent primaries are any indication, the sentiment hasn't translated into votes for Tea Party and conservative-backed candidates in all races. Establishment politicians came out on top in two of the three heavily contested Senate primary battles May 4, though turnout was low. In Indiana, former Sen. Dan Coats won his state's Republican primary battle for the Senate, beating four other candidates. But State Sen. Marlin Stutzman finished second with the support of local Tea Party groups and Tea Party hero Sen. Jim DeMint, R-South Carolina. Voters in the middle and independents will be a true litmus test on how establishment-backed candidates will fare. Independents tend to favor Republicans on fiscal issues and Democrats on social policies. That concept may help one candidate -- if he makes it past his state's Democratic primary. Sen. Arlen Specter, who spent 30 years as a Republican, is up against Rep. Joe Sestak in Pennsylvania's May 18 Democratic primary. Sestak routinely reminds Democrats that Specter was a Republican until about a year ago. Rothenberg said there was a time when Specter could get re-nominated within the Republican Party, "but couldn't this time." Before switching, Specter faced a tough GOP primary fight against former Rep. Pat Toomey. Another Democrat, who doesn't necessarily have a tough primary fight, has a big challenge on her hands this fall. Sen. Barbara Boxer, D-California, faces what's expected to be a tough re-election battle as she makes a bid this year for a fourth term. According to a recent Public Policy Institute of California survey, Boxer is in dead heats in hypothetical general election matchups with Republican candidates Carly Fiorina, a former Hewlett-Packard CEO, and former Rep. Tom Campbell. According to the poll, Boxer slightly leads state Assemblyman Chuck DeVore in a possible November matchup. Even those held in high esteem by the Tea Party face a backlash over choices they make. Former Alaska governor and 2008 GOP vice presidential candidate Sarah Palin drew big crowds at the Tea Party's first convention in February and a Tax Day rally in Boston, Massachusetts, in April. But she drew the ire of followers when she endorsed Fiorina over DeVore, who has received the backing of the Tea Party Express and conservatives. After Palin announced the endorsement on her Facebook page, a number of her followers questioned why she would side with Fiorina instead of DeVore. Palin eventually updated her Facebook post and listed Fiorina's conservative credentials, including her opposition to abortion rights, her support for gun rights and opposition to "Obamacare." CNN's Candy Crowley, Peter Hamby, Mark Preston and Paul Steinhauser contributed to this report.